Please write to us at indian.ortho@gmail.com about what you feel about IORG and where we should head in future. The Indian Orthopaedic Research Group was started in 2007, however 2011 was the year that established IORG as a cohesive group with a definite direction and aim. It was the year that IORG became one of the fore front organisation of Indian Orthopaedics with a unique agenda of Research and Collaboration. We became one of the largest online communities in Orthopaedics and our Case discussion forum had more than 500 cases being discussed every month and more than 20 thousand Comments every month. We started the IORG Associate membership which had a good response along with the IORG website. IORG website has become a unique portal for all Orthopods, where they can showcase their presentations, find information and also get information about the work of IORG. Case Discussion forum: Our online case discussion forum has almost 15,000 orthopaedic surgeons around the world. Visit the link below to join the forum. 4. OrthoTV our latest venture in the academic field. We need active support from the Orthopaedic community. Please join us in our endeavors. This is a new Journal from IORG which will focus on complications and complicated cases. Orthopaedic Journals: Need to Change? We thank all members for your continued support and participation in developing IORG into what it is now. This has encouraged us to strive to further improve our services to you and to meet our principle goal of promoting quality research. However, we would like to do much better and in this direction want to conduct an online survey for all IORG members. The idea is to help you members to co-create and co-design our various services especially our flagship journals so as to improve their scientific content and make them more reader friendly. We request you spend a few minutes and complete this survey and help us give our best. The Indian Orthopaedic Research Group (IORG) is dedicated to promoting evidence based clinical orthopaedic research in India. IORG advocates for garnering more resources for research, and increasing awareness in the Indian orthopaedic community of the impact of orthopaedic research. The specialty of Orthopaedic Surgery has developed in the recent past in leaps and bounds because of new challenges and avenues opened by active research. India in particular and Indian sub-continent as a whole has lagged behind in this field of basic and evidence based clinical orthopaedic research. IORG is a humble atempt to further the cause and promote orthopaedic research inour country. Indian Orthopaedic Research Group is registered organisation with Govt of India. IORG currently runs on financial support by its members and from Donations and Sponsorships. Support provided by the members is used to maintain the infrastructure, website and also to develop new services and resources. In due course with further development and expansion of IORG we should be able to provide better service and to hold conferences and workshops to promote Orthopaedic Academic Research in India. 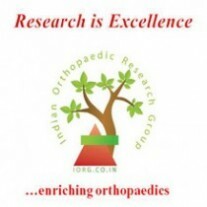 Indian Orthopaedic Research Group is first of its kind organisation that is purely initiated, developed and expanded by independent Orthopaedic surgeons with a common passion for Indian Orthopaedics and an intense wish to increase quantity and quality of Publications from country. What started as few sprinkles has now grown into a stream and eventually with help of our well wishers IORG will grow into a huge force. As respect to all individuals. seniors and colleagues, who have supported us by there words, deeds and encouragements, we solemnly pledge to do our best to achieve the common goal of elevating further that stature of Indian Orthopaedics on the stage of World Orthopaedic Literature. The Information on the website www.iorg.co.in is property of Indian Orthopaedic Research Group and the Contributing Authors. The content is protected by Indian and International copyright. Any reproduction requires written permission from IORG and contributing authors, which can be obtained by sending requirements to indian.ortho@gmail.com. However IORG is committed to provide most information on the website free of charge to everyone. To ensure non-commercial use of the contents, Indian Orthopaedic Research Group by Indian Orthopaedic Research Group is licensed under a Creative Commons Attribution-NonCommercial-NoDerivs 3.0 Unported License as below. Details of Creative common License for IORG is as below. An acknowledgement to Indian Orthopaedic Research Group is essential for such Use. Permissions beyond the scope of this license may be available at http://iorg.co.in/privacy-policy/.